Published in Rafu Shimpo, June 11, 1956. Six girls and boys receive awards from American Legion Post #325 at Foshay Junior High School in Los Angeles, California, June 11, 1956. Four girls stand in front row; Caucasian man stands wearing garrison cap with American Legion patches stands in center back row flanked by two Caucasian women and two male students. Four of the students hold certificates. Group stands on lawn with multi-storey school building in background; boy holding books stands in background, right. 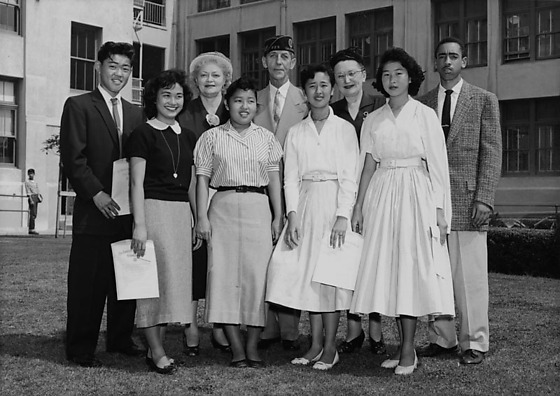 The people are identified: (first row) Kiyofumi Fukumoto, Takako Satogami, both medal and certificate winners; Susie Kinoshita, winter certificate winner; Ann Hiramatsu, summer medal and certificate winner; Nancy Takahashi, second place essay contest winner in district; (second row) Mrs. Vilma Wright, Harold A. Coogan, Mrs. Jane L. Murray of the Milton Kanode American Legion Post and Auxiliary. Typed on original negative envelope: American Legion Awards at Foshay Junior High School.